The increase in culture of partying and socializing has also increased the tendency of ‘drinking’ in Nepal. While Nepal had been brewing local home brewed alcohols since the beginning of ethnic civilizations, it wasn’t long before that sophisticated drinks like beer, Whisky and Vodka manufacture was started in the country. With increase in the tendency of consuming wines and light alcohols in parties, many beverage manufactures have started to make wines. The wine manufactured in Pokhara, Dadaghare is considered to be the first Nepali wine. It is not only popular among the local customers but also foreigners. The wine available in four different flavors- Aangan, priced at Rs 360 per 750ml; Pidi, Rs.360; Majheri Rs.495 and Aati, Rs.500, is manufactured using various fruits, herbal fruits and honey and is absolutely chemical free. 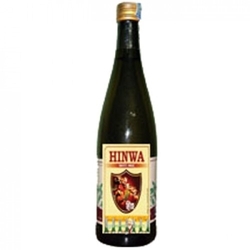 One of the most popular wines, Hinwa is manufactured by Makalu wine industries at Sankhuwasabha. Made from wild fruits like raspberry, Himalayan barberry and saffron, the wine first started manufacture in 1995. The number one brand in the Nepali market, a bottle (750 ml) of Hinwa costs Rs.380. Manufactured by Sakaro Beverages, Nettlange is one of the popular Nepali wines in the local market. Made from nettles (Sishno) and oranges, a bottle (750ml) of this wine cost Rs.450. Made from black grapes that are imported from India, and apples from Mustang, Grapple is manufactured by Sakaro Beverages. One of the popular Nepali wines, a 750ml bottle of Grapple costs Rs.350. One of the fast selling brands available in the market, Divine wine was introduced in 2010. The wine manufactured by Shree Mahakali wine, it is made of grapes, spices, tea and various other fruits. A 750ml bottle of this sweet wine costs Rs.340.